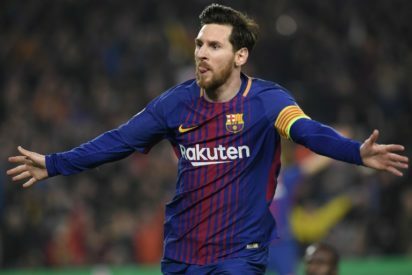 Barcelona set another record and took a further step towards the 2017/18 title in a LaLiga weekend which also brought bittersweet moments for Fernando Torres of Atlético Madrid and Isco of Real Madrid. LaLiga leaders Barca were pushed all the way by Valencia at the Camp Nou on Saturday, but Brazil star Philippe Coutinho assisted goals for teammates Luis Suarez and Samuel Umtiti, and Dani Parejo’s penalty was not enough for Los Che. A 39th consecutive game unbeaten saw the Blaugrana set a new all-time LaLiga record – and they now have an 11 point lead with just five games remaining. Atlético remain second, with Sunday afternoon’s 3-0 victory at home to Levante seeing Diego Simeone’s side into the Champions League for a sixth consecutive year. Angel Correa and Antoine Griezmann put the Rojiblancos in charge, before soon to depart fans’ hero ‘El Niño’ Torres entered as a substitute and netted his 100th career LaLiga goal. Madrid jumped over Valencia into fourth spot by winning 2-1 at Malaga on Sunday evening, with Isco man of the match against his hometown club. The Malaga-born playmaker pointedly did not celebrate after curling in a 25 yard free kick, or when later setting up the second for teammate Casemiro. Diego Rolan’s injury time strike was not much consolation for the bottom side. The weekend began Friday, with Real Betis taking a firm hold of fifth place thanks to Joaquin Sanchez producing one of the assists of the season. The 36 year old Verdiblanco captain carried the ball at pace from his own half before playing in Loren Moron for the only goal at Girona. Sixth placed Villarreal went 2-0 up at Sevilla on Saturday afternoon through Daniel Raba’s header and Carlos Bacca’s goal against his old club. But the seventh placed Andalusians hit back through Nolito’s volley and Steven N’Zonzi’s long ranger as both clubs remained in likely Europa League spots. Celta Vigo’s European qualification chances took a blow as they lost 1-0 at Leganés on Saturday afternoon, with Miguel Angel Guerrero converting Nabil El Zhar’s cross. Alavés’ Swedish striker John Guidetti’s low strike after just four minutes decided Sunday lunchtime’s Basque derbi at Eibar. Later that day, Uruguayan defender Damian Suarez’s 35 yard free kick secured the three points as Getafe beat Espanyol to climb into the top half. In the relegation battle, Deportivo La Coruna gave themselves hope after Clarence Seedorf’s side edged a five goal thriller at Athletic Bilbao on Saturday evening, with Depor captain Adrian Lopez scoring twice for a second consecutive game. Las Palmas’ chances of survival were hit by a 0-1 loss at home to Real Sociedad, with winger Mikel Oyarzabal netting. A midweek round of LaLiga games begins Tuesday with Deportivo hosting Sevilla, leaders Barcelona at Celta and Leganes visiting Villarreal that same evening. Wednesday sees Athletic Club coming to Madrid’s Bernabeu, Valencia at home to Getafe, and Espanyol against Eibar at Cornella el-Prat. Thursday brings Atletico’s Griezmann back at his former club Real Sociedad, Girona at Alavés, Levante aiming to move closer to safety at home to Malaga, and Las Palmas really needing a win at Betis. The post LaLiga weekend brings new record for Barcelona appeared first on Vanguard News.